Fupete and Erika Nasonero are the names behind the project Fupete. The couple has been living and working together for seven years now. Like a perfect Italian couple, they warn me that they disagree a lot but as you may find at the end of this interview, they are in complete synchrony. I must say it was a pleasure talking to these two lovely and brilliant artists that took me down the memory lane and shared their thoughts about work, life and inspiration. How did you first get involved in arts? Fupete: Easy. My grandfather was a painter. He was part of the painters that did the classic italian style paintings from last century, from the beginning of the century; called Macchiaioli. He painted impressionist landscapes. He painted all his life but he started around his 40s and painted until 81 or 82 years old. As a painter he maintained all of his family. He wasn’t a famous artist; painting was his job. He had a gallery for 40 years. He didn’t get to be rich but he managed to sustain the family well. He died when I was 14 so I didn’t have enough time to share with him about art or whatever but every day of my life I remember the smell of the oil paint. When I was a kid I used to watch him paint very close to him. I didn’t study art, but for years I’ve kept thinking about these memories and I realized I wanted to be an artist. I studied other things like Engineering but in the end I came back to this image, this memory…He was also an actor, a very crazy guy! His name was Giacomo and he was part of the Vernacular Theatre. Erika: For me it’s completely different. No one in my family likes art. When I was 18 I started to study History of Art at the university and I quickly started to manage and organize exhibitions and festivals. I’m an art curator. Our relationship is ‘complicated’ (referring to her relationship with Fupete) because I am a curator but also an assistant and in this work for NOVA we came up with the idea together. Fupete: We’ve been thinking together for many years now. Fupete is an artwork that used to be only mine but it’s been six years that we’re together and there’s a lot about our relationship in our work. It’s been many years since we wanted to do something like Jean Claude; their work is strictly related to their relationship. In our case it’s the same. We are together 24 hours a day. What’s the story behind the name FUPETE? F: I can tell this story in many ways; it can be very fascinating or very easy. My nephew was born in Spain; when he was around two years old he used to say this all the time “Quiero un fupete” that means “I want a fupete”. This was actually a language mistake, a kid mistake, he wasn’t able to pronounce the “ch” and say the correct thing that is “Quiero un chupete”, meaning “I want a pacifier”. At that time I was doing my first series of painting and thinking about being a professional artist and I was searching for a name. I grew up in a culture of nicknames and my name is not a secret but I love to live a second life. I can choose to be whatever I want. When my nephew was asking for a ‘fupete’ I was intrigued by this word. So, it’s an invented word by my nephew. The word doesn’t exist. I thought it was perfect! Since it’s a word that doesn’t exist, if you google ‘fupete’, there’s just me! There are also some books that show up under the name fupete by Leonardo but I didn’t manage to understand what it is. Maybe it’s also an error (laughs). Can you talk a bit about the work you are developing here? F: The title of this work is “Raw Canvas” and it’s a new series of work we’ve been planning to do for many months now. In the past few years, most of my works for exhibitions, my paintings, my drawings went outside the limits of the canvas. I would fulfill the walls of the gallery or the place that the work was being showcased. Many journalists have related these works to street art or urban art because I started to do art when I was in Rome and most of my friends are street artists there, but my work is different from the works on the walls of the streets, I just don’t want limits. And the canvas is a limit for me. The idea of the work is that it still remains Fine Art for me, because I was a kid and I saw my grandfather painting and he was a fine artist; and for me that was incredible! I always dreamed about being like him. My work is mostly related to limits and borders. The idea here is to have a classic canvas, a framed canvas that is stretched trying to escape the limits and conventional shapes. Once it’s finished, it will be more like a sculpture. I still have to paint it to get my idea done, to use it as a real canvas. I want to express this idea that it’s just a painting; it’s a painting trying not to have limits. E: This idea also comes from the idea of NOVA. This is a festival where experimentation is very appreciated so we were at home thinking about some kind of work that would also go in this direction. We thought that we would be free to do something very big also. F: The idea is to have a flow that goes into space. In the end it will be graphic as well because of the painting. E: Also the canvas allows us to create round shapes, something circular that wouldn’t normally be possible for a canvas. F: This work could have been done in other materials; people ask us why we didn’t do it in a random textile or other materials like silicon. The idea is to use a real canvas, the same material you would use to stretch on a frame. We want to relate this work to painting. E: The idea is to extend the canvas. In the end it’s this only. F: Yes. Very simple. And we were very surprised because in all of our research, we might be mistaking, but no one has done this before. E: We wanted to do something that didn’t already exist. F: When we had this idea we thought that a lot of people might have done it but we only found a few experiments on this kind of work, but they were all very small and this is very strange because this material is very cheap, it’s just wood and raw canvas. I love to have a classic painting on my wall at my place, or a classic poster. I also paint classic canvas; I would love people to have my work on his or her wall but then I think, “Why not extend it? Why not open the canvas and try to see what’s inside?”. E: I hope it’s going to be very nice! F: In the last couple of years we’ve learned a lot and we have become more courageous and daring. F: Most of my work is about improvising. Most of her work (points to Erika) is improvised as well. 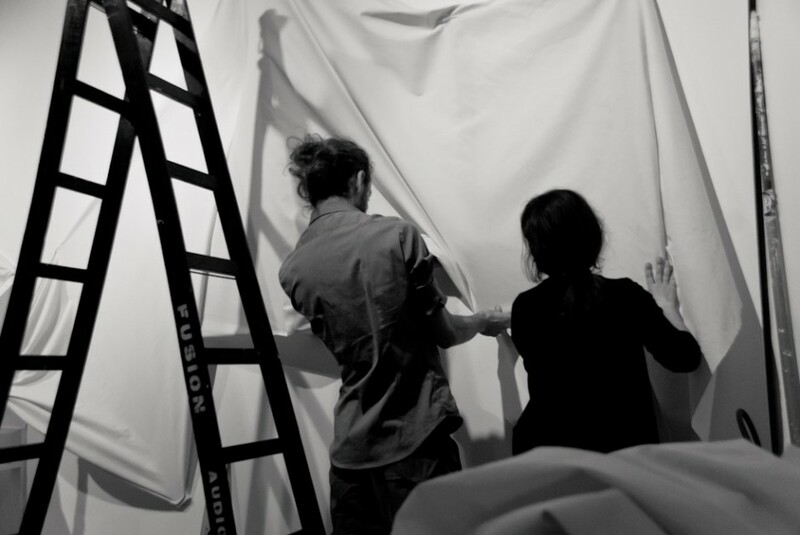 When we curate events or exhibitions of other artists, the way we do it is strictly related to the action of the artist. So this festival is perfect for our work! This festival is perfect for us. We work in progress every day of our lives. We live in a work in progress (laughs). F: We had a gallery in Rome for a couple of years. Studio Fupete, it was my studio and also a gallery we shared. E: That’s when we started working together. F: Yes. It was our first year working together. Seven years ago…we had this gallery and after a year it started to do really well but at some point we realized that it was too much work and that we were going in a direction that wasn’t taking us where we wanted to go. There was too much involvement in the gallery and Rome is very expensive. At a certain point we saw ourselves going in strange directions so we chose to leave everything behind and go back to Tuscany, in the countryside, back to our origin. After seven years I can say it was a good decision. E: We did the right thing. We can work really well back there since we don’t have many inputs; we have to improvise. F: We have a lot of limits there. It’s far away from everything and this brings you a lot of limits in a certain way. When I do workshops with kids I try to teach them that limits take you to freedom, you know? If you know the limits, you know what you have to do to be free. E: If you don’t have limits, in the end you do nothing. F: It’s harder to work without limits. Do you like to work in collaboration with other artists? F: I try… I’ve done much collaboration in the beginning of my career, in the last few years not so much because we moved to the countryside. I always worked alone, most of the time. I did a few projects with ROJO involving other artists. It’s been many years since I worked together with another artist like I did here with Yang02. I really enjoyed that Takahiro asked me to do something on his wall. It wasn’t planned. I started doing it and we shared a language, there are many words written in Japanese. I think it’s really nice because it’s a machine mixed with a human hand. E: And at the same time there aren’t many situations where you can do collaboration back in Tuscany. F: We are doing some collaboration but with other kind of arts, not visual arts. We’re doing things in theater, music, and other kind of stuff. E: Last year we did a lot of things in this direction. F: With other kind of arts, yes; like performing arts. We’re trying to develop a live drawing performance with tagtool. We’re trying to use it in many ways. E: With tagtool you can draw live and you can project the image wherever you want. F: Without the computer in front of you, you just need the tablet and a wall. How does your creative process start? F: You’re going to have very different answers here (laughs). For my process I need do make a lot of mess in the beginning. E: (laughs) Ah! Yes! We are the opposite! F: The mess can be whatever. It could be hours searching for references on the web or at a library. It could be a drawing of whatever and I spend days drawing, after a couple of days I go back to my mess and try to figure out what I can take out of it. Sometimes I wake up in the middle of the night and draw or write. And in the morning after I realize I had an idea and I just go from there. This has happened many times but the idea always comes out of the mess I did inside my brain days before (laughs). I need a lot of things and information to stimulate my process. E: For me is different. I need to see things to visualize my idea. F: This is nice and is one of the things I love about her. I met her during a period of my life in which it was very difficult for me to choose what was good and what wasn’t good from my work. After I got to know her she went like “Ah! This is good!” or “No! This is not good! Not good at all!” (laughs). Just intuitive! E: Yes. It’s very simple, no? I’m very intuitive. E: He is very rational. F: A lot of people see me painting and think I’m going completely random because I make a lot of mess. But for me it’s like a dance, dancing is strictly related to the brain. When you dance, you can go random as long as you know the basis. For me it’s about harmony, if I just go random, this painting will end up in the trash; that’s for sure. I need to have rhythm; and this is completely intuitive. It’s hard to explain, for example, when an actor is really good, you know his good even if he is not acting, you can tell by his presence. E: It’s not easy to explain this process…I’m not like him, I don’t have a lot of ideas all the time. F: Most of the time she gets tired of my ideas. E: So I think we complement each other. F: Not in all the aspects, but we are complementary, yes. E: I can choose what’s good about his work and he gives me a lot of ideas! F: A lot of people who gets to know us during festivals think that I talk a lot and that she is quiet. But in real life we’re the opposite, she does the talking and I’m very quiet. F: And she talks a lot! (laughs) The thing is, when you’re in a festival, it’s like having too much water in a glass, and if you don’t get rid of some of this water you will spill everything on the floor. And I need to talk a lot with other artists and the people I meet. Most of them are new for me. E: I like to observe the other artists. When do you know the work is done? F: She’s very intuitive, so… For me it’s strange… Maybe when I don’t hear sounds anymore. When I’m drawing I have my headphones on but I can do it without, on my own, with my own sounds and at a certain point this rhythm just disappears! It’s finished. E: I think he checks all the possibilities before finishing his works, no? F: Yeah, maybe. I did a lot of mistakes putting on one more layer of paint! So I’m starting to learn when the work is done. (laughs) It’s about happiness because if the work is really finished, you are happy. You feel that you’ve given life to a son in someway. You can’t be sad if you give life to someone. E: We look up a lot of things on the Internet. We look up a lot of things besides the Internet too: books, images, other artists and other arguments. Experimenting is also very inspiring! F: She said probably many of things that also inspire me. What she didn’t say is that working in the forest, in the countryside inspires both of us. E: Traveling and staying in the nature really inspires me! F: I think that if inspiration is related to the act of doing art then it is also strictly related to the difficulty of being an artist today, for me at least. You can use a lot of practical information, read books, sketch…but I think that the main argument about what inspires me is completely related to this difficulty; this inspires me to go forward! It’s really hard to be an artist nowadays. F: Or stupidity, maybe (laughs). When I started as a graphic designer, of course I had more money and I know I can do that job. But that’s not who I am. I can’t do that anymore. In the end, it’s not about how much you have but the richness arts bring you in the inside. Also the period and moment in life you are living inspires the work; it can’t be separated. Like this work we’re doing here, we wanted to do this for a long time but if we did it back home it wouldn’t make any sense. The fact that we’re here makes it possible. The festival itself is an inspiration for this work. What’s your favorite kind of music? F: For you it’s very simple: Rock. E: Yeah! (laughs) and I also like experimental music, any kind of music that makes you go forward. And I don’t like electronic music. F: I notice that most of the people that you asked this question mentioned their favorite bands…but we’re not able to do it. I listen to a lot of music but it’s completely random. E: If I think of a band I can say maybe The White Stripes but there are many! I listen to a lot of things but I don’t remember the names of the songs or bands because I don’t want to. It’s a lot! F: Every artist that visits our home is asked to leave us a playlist on our computer. We have hours and hours of music. Many of them I’ve never heard in my entire life! Our relationship with music…Ah! Relationship it’s nice! Our relation with music is about empathy. Maybe if I had to say one artist I would go with Keith Jarett. His music saved my life…I learned that music can also be a medicine. How would you describe the feeling of NOVA? F: You go first. (laughs) I always put her in front of me…always. E: I think the energy here is perfect. You can talk and meet artists that live in another part of the world and see what they’re doing. It’s very inspiring! I think it’s really, really cool. For me this is real. Very nice! F: I’m very happy to be here and very honored. I’m proud of being invited by David. This last week I was here was very intense, vivid and funny! It was perfect for my creative process. I love the idea that there are people watching me work.